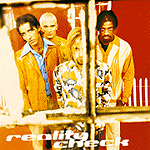 Reality Check is a Christian alternativerock band that formed in the mid 1990s with the support of Michael Tait of dc Talk. Originally consisting of three members, Chris Blaney, Nathan Barlowe, and Rod Shuler, the band grew to eight members before disbanding in 1998. Two members of Reality Check, Nathan Barlowe and Jonny MacIntosh, went on to help form Luna Halo.